Sergeant, Co. K, 29th Mass. Inf. Born at Haverhill, Mass., April 10, 1837. Born at Grafton, Mass., August 18, 1844. ‘”The fighting at Fort Stedman brought out many examples of great individual bravery and furnished numerous incidents which prove the pluck and indomitable courage of the Union soldier, no matter whether he was in a victorious battle or facing defeat. At Fort Stedman particularly, where the Federals were treated to a surprise by the enemy, their conduct was such as to force even the foe to admire it. It is recorded, for instance, that one private of the Twenty-ninth Massachusetts Infantry was surrounded by a group of rebels, seized by the throat and ordered to surrender. His reply was: “Never.” Whereupon he was clubbed over the back with a musket and shot in the head, but in spite of his injuries fought with his opponent, and escaped. Other brave deeds were those of Sergeant-Major Charles H. Pinkham, of the Fifty-seventh Massachusetts Infantry, and Sergeant William H. Howe, of Company K, Twenty-ninth Massachusetts Infantry. Howe’s regiment was in camp within the works when the Confederates entered and surprised them. No shots were fired, the Confederates using only the butts of their muskets. The regiment was forced to retreat, leaving a great number of its men in the hands of the victorious rebels. When the Federals were already driven out of their works and the rebels in full possession of the camp Sergeant-Major Pinkham rushed back into the very midst of the enemy, entered a tent, seized the regimental colors, and dashed back with his precious treasure to his own lines. 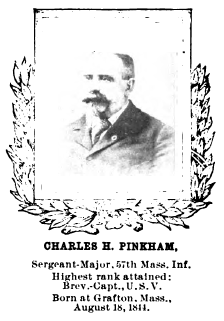 During the subsequent fighting for the recapture of the camp, which ended in an utter rout of the rebels, Sergeant-Major Pinkham had a chance to seize the colors of the Fifty-seventh North Carolina Infantry and carried them triumphantly into the Union lines. 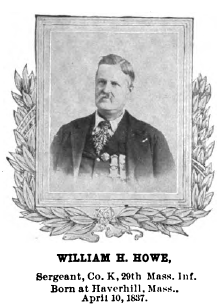 Sergeant Howe was one of the Union soldiers who was captured when the rebels took possession of the fort. He managed to escape his guard, however, and rejoined his comrades in front of Fort Haskell. When volunteers were called for to serve an abandoned gun, he with five others undertook to perform the work. They were exposed to a most galling fire, but he worked the gun with such telling effect after all but two of the battery men belonging to the piece were killed that the Confederates were forced to retreat before its withering fire, allowing the Federals to come up to the support of the brave volunteer gunner.